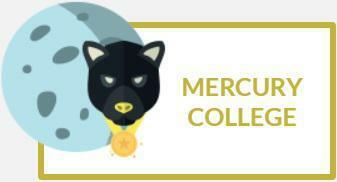 Welcome to Mercury College! Represented by the majestic and cunning Black Jaguar, we strive to push ourselves to achieve our absolute best, hence our college motto Ad Victoriam. Our college colour is yellow which helps us to stand out from the crowd! This year, our goal is to continue to work in harmony as a supportive and dedicated college, achieving many tokens as a result of our hard work. We also aim to continue to achieve excellence in sporting events, as well as achieving success in competitions such as Poetry Recitals, Mathletics and Attendance (amongst many others). Our College Board is located on the far-side of the reception area. We are ALWAYS looking for fantastic examples of work to place up there; previous examples include poems, posters, pictures, book reviews and photos. Feel free to give any pieces you create to Ms. Joseph-Fenwick or Ms.Barkley to place on the board. The band's 1977 album News of the World contained "We Will Rock You" and "We Are the Champions", which have become anthems at sporting events. Written by lead singer Freddie Mercury, "We are the Champions" was a worldwide success, reaching number two in the UK Singles Chart, In 2009, "We Are the Champions" was inducted into the Grammy Hall of Fame. In 2011, a team of scientific researchers concluded that the song was the catchiest in the history of popular music. Ad Victoriam is an accusative construct in Latin. Ad means "toward", and victoriam means "victory". It translates to 'toward victory'. It was used in the Roman era, as a batllecry, by the Roman soldiers. Mercury is the smallest planet in the Solar system and dwells closest to the sun. It is named after the Roman deity Mercury, the messenger to the gods. Mercury's surface appears heavily cratered and is similar in appearance to that of the moon, indicating that it has been geologically inactive for billions of years. Having almost no atmosphere to retain heat, it has surface temperatures that vary diurnally more than on any other planet in the Solar System, ranging from −173 °C to 427 °C during the day across the equatorial regions. The polar regions are constantly below −93 °C. Two spacecraft have visited Mercury: Mariner 10 flew by in 1974 and 1975; and Messenger, launched in 2004, orbited Mercury over 4,000 times in four years before exhausting its fuel and crashing into the planet's surface on April 30, 2015. The Jaguar (Panthera onca) is a wild cat species. It's present mostly in the American continent. It is listed as near threatened on the IUCN Red List and its numbers are declining. The Jaguar is the largest cat species in the Americas and the third-largest after the Tiger and the Lion. Its preferred habitat is tropical and subtropical moist broadleaf forest, swamps and wooded regions. The jaguar enjoys swimming and is largely a solitary, opportunistic, stalk-and-ambush predator at the top of the food chain. The jaguar has an exceptionally powerful bite, even relative to the other big cats. This allows it to pierce the shells of armored reptiles.